Chris Nesmith has been named dean of the University of South Carolina Salkehatchie. He previously served as associate provost and dean of Extended University, a division of Palmetto College housed on USC's Columbia campus, and he has served as interim dean of the Walterboro and Allendale campuses since Jan. 1. USC Salkehatchie is one of four Regional Palmetto Colleges - including USC Lancaster, USC Salkehatchie and USC Sumter - in the University of South Carolina System. The inaugural recipient of the Denise R. Shaw Excellence in Scholarship Award for Palmetto College Campuses was presented to Julia Elliott, associate professor of women and gender studies in Extended University. D.J. Bron has been sworn in as a magistrate in Laurens County after earning his degree from the University of South Carolina Upstate through Palmetto College. Chastity Graham recently joined the staff of the College of Education as the Field Placement Coordinator for Palmetto College, which is part of the Elementary Education program. A new round of TV advertisements for the University of South Carolina's 3-year-old online degree program will hit S.C. airwaves next spring. 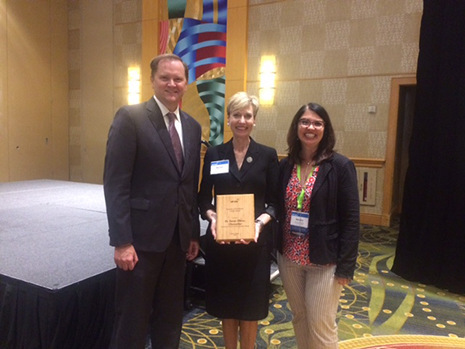 One year after Dr. Susan Elkins receives the ACHE Leadership Award, Palmetto College receives the Credit Programming Award at the October 2016 ACHE International Conference in New Orleans. Dr. Sarah Miller, associate professor of history at USC Salkehatchie, is the inaugural recipient of the Dr. Chris Plyler Excellence in Service Award; the Plyler service award is presented to a faculty member who personifies excellence in service to the campus, university, community and profession. Dr. Kajal Ghoshroy, associate professor of biology at USC Sumter, is the recipient of the Dr. John J. Duffy Excellence in Teaching Award; the Duffy teaching award is presented annually to a faculty member who exemplifies excellence in and out of the classroom. This fall, Fran Castleberry received the 2015 H.D. Barnett Sr. Award at the annual USC Sumter Awards Recognition Ceremony. Fernanda Burke and Darris Hassel have taken on the reins of USC Lancaster's Lady Lancers volleyball team as coaches for the team's inaugural season. Dr. Christine Sixta Rinehart, an assistant professor of political science at USC Union's Laurens site, is researching drone strikes for her second book - Targeted Killing in the Middle East: An Appraisal of American Counterterrorism Policies.